Britain has a very hard choice to make over Brexit and very little time to make it. Should it remain in the customs union that allows goods to flow freely across the European Union? Should it leave the customs union? Or opt for somewhere in between? How best to approach this riddle has been the subject of a major political brawl in recent days. The answer could bring down the U.K. government (say British media), prevent it from striking a Brexit deal with the EU, or both. The customs union enables the 28 EU member states, and other countries such as Turkey that have signed up to its rules, to function as a single trading area. In practice, it means that cars made in France can be sent to Italy without facing tariffs or a customs check at the border. Goods made outside the union are allowed to circulate freely once they've gained initial entry. However, membership prevents a country from negotiating its own bilateral trade deals with other nations. The ability to agree new trade deals -- with the United States or China, for example -- is central to Prime Minister Theresa May's vision for Britain after Brexit. In a speech in September, she ruled out staying in the customs union. But media reports in recent days have suggested that a customs union deal covering goods could be back on the table, leading to rebellious talk among members of May's party who want a clean break with the EU. They were incensed by Treasury chief Philip Hammond's remarks late last month that the ideal divorce deal would leave Britain only "very modestly" different than EU members. He worries about the impact on business. There's little doubt that leaving the customs union will disrupt the flow of goods between Britain and its largest trading partner, and May's government has suggested two arrangements aimed at minimizing the economic fallout. Confusion over what the U.K. wants to achieve cast a pall over talks Monday between British and EU negotiators. Chief EU negotiator Michel Barnier said that clarity on what the U.K. wants is urgently needed. "Without a customs union, and outside the single market, barriers to trade in goods and services are unavoidable," he told reporters in London. "The time has come to make a choice." The first option floated by the British government is a "highly streamlined" customs arrangement that would use new technology -- much of it expensive and untested -- to "deliver as frictionless a customs border as possible." The second is a "customs partnership" under which Britain would mirror EU import controls on goods from outside Europe, eliminating the need for many customs checks when they enter the EU. Britain has just 13 months to negotiate its future trade relationship with the EU, but May's Conservative Party and even her own cabinet are deeply divided over how to proceed. May, who meets her senior ministers this week in an attempt to settle on a way forward, has been conspicuously silent even as businesses cry out for clarity. A spokesman for the government said Monday that it believes it can achieve "as frictionless as possible" trade with the EU because doing so is in the interest of both parties. Even if top British politicians can settle on a preferred option, there's no guarantee it will be accepted by the EU. London has already pledged to avoid the return of a hard border on the island of Ireland, an extremely complicated issue that was not fully resolved in the first phase of negotiations. 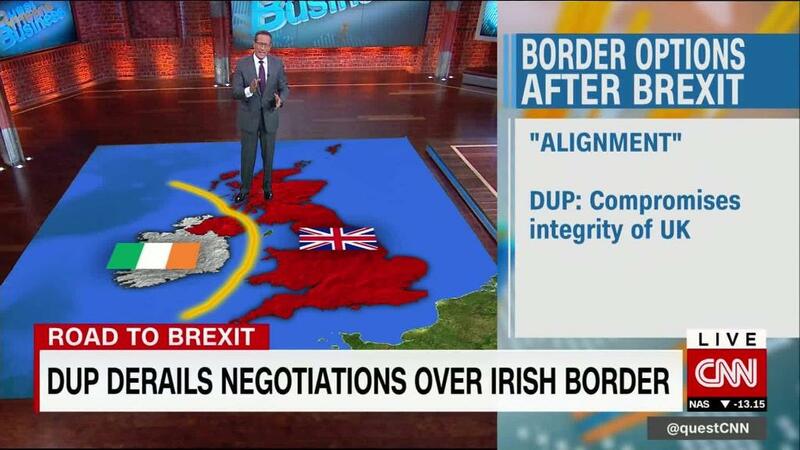 Analysts say that avoiding a physical border -- along with related "checks and controls" -- means that Britain must remain very close to the EU. The terms of the deal announced in December stipulate that if final agreement on the Irish border can't be reached, Britain must continue to abide by the rules of the EU's internal market.